Alkaloids: Chemical and Biological Perspectives, the 15th volume of the ACBP series, features four important reviews of research on alkaloids. Chapter 1 is the first comprehensive review of the carbon-13 and proton NMR shift assignments and physical constants of diterpene alkaloids and their derivatives. 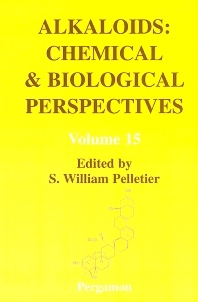 In addition to the catalogue of spectral and physical data, the chapter includes a table of the occurrences of these alkaloids in various plant species, tables containing molecular formulas versus calculated high-resolution mass values, and calculated high-resolution mass values versus the molecular formulas of diterpenoid alkaloids, as well as seven tables summarizing the carbon-13 chemical shifts of various functional groups in diterpenoid alkaloids. Chapter 2 is a fascinating review of the supercritical fluid extraction of alkaloids. This technique using basic modifiers, provides an alternative method for the extraction of alkaloids. Chapter 3 summarizes recent advances in the synthesis of Amaryllidaceae alkaloids, an important class of naturally-occurring bases and neutral compounds. The increased activity in the synthesis of these alkaloids over the last decade is undoubtedly due to the fact that certain members of this family possess interesting and useful biological properties. Elegant syntheses, chiral and otherwise, of structures incorporating many asymmetric centres are reviewed. Chapter 4 reviews radical cyclization reactions in the total synthesis of indole alkaloids. The use of free radical chemistry in the synthesis of alkaloids has grown markedly because of the mild reaction conditions, tolerance of a wide variety of functional groups, and the good stereoselectivities. Each chapter in this volume has been reviewed by at least one specialist in the field. For scientists working in the fields of natural products chemistry, medical chemistry, pharmacology and biochemistry, organic chemistry, heterocyclic chemistry and plant science.